The K.I.S.S. Principle is a Golden Rule of Foot. What does it mean? How low-tech!! Definitely not for the 21st Century!! When dealing with many lower extremity problems, the KISS principle should be the ground the patient and doctor stand upon. Of course, this implies the doctor or therapist knows simple, yet effective, solutions for every day problems that occur. Covering a bleeding, gapping, wound with a band aid, is a simple, yet probably not effective solution. So, the doctor and patient should attempt to work as a team (another Golden Rule of Foot), to develop a strategy based on simple progressing to complex treatments. Who is stupid? Normally, it is the doctor or therapist, with their massive intensive medical training that make a mountain out of molehill. It is an error in medical training to learn the newest, most sophisticated, techniques, but be ill-trained in the simple techniques. Often, it is my patients, who calm my anxiety down, and let me know it is alright to start simple. I appreciate their help in this grounding. But the patient can also be at fault for wanting a seemingly quick cure using the most high-tech solutions. It can take some trial and error to learn what works and what does not work in relieving symptoms. Patients can get impatient with this process. Doctors and therapists can over-react to this impatience by ordering unnecessary tests or doing unnecessary procedures. Does this mean I am a simple doctor, limited to simple remedies? No way!! If you start simple, you must know what to do if that does not work. A good doctor/therapist should have a range of simple to more complicated treatment regimens to choose. It is quite an art deciding when to advance treatments. It is the art of medicine that most practitioners love. Simple and Effective solutions do exist. Our society almost cries out the contrary. Better technology must mean better solutions. But it often does not. Most of my foot treatments are simple, some more effective than others. The more disabled the patient, the more my mind wants more technology to save us! The patient/doctor or patient/therapist relationship must evolve around a KISS principle, with ascending complexities based on the progress of the patient. This is the official website of the American Academy of Podiatric Sports Medicine. I am an ex-president of this national organization. The website can direct you to finding sports medicine podiatrists in your area and other helpful articles, tips, etc. The fellowship status of some members denotes the highest level of sports medicine accreditation in the field of podiatry.I will refer to this website frequently in my writings. Get familiar with the website quickly by reading the short article entitled: How socks make the feet. After over 30 years practicing the science and art of podiatry, I fully appreciate the role of 2nd opinions for treatment of injuries. I am fortunate to work at an institution that 2nd opinions are almost 2nd nature. But, it is not the norm. I believe getting a second opinion for orthopedic/podiatric surgery is really a no-brainer, unless you are stuck in an emergency situation. But for most cases of elective foot and ankle surgery, getting at least 2 opinions can be helpful. It is ideal that a non-surgeon (podiatrist, therapist, primary care physician, sports medicine physician) helps you decipher the recommendations of two surgeons before you go under the knife. This is the ideal world, but hopefully, you can get this type of ideal treatment. For most, that is way too much work to do. But, you can not go back and reverse surgery. Even, when the two surgical opinions are identical, you will develop a feel for which surgeon you want to do the surgery. Find out how the surgical approaches are different, and what differences are in the post operative treatment. Second opinions for complicated non-surgical problems are less commonly done. But, the approaches of physicians can be so different that they should be done when improvement is stymied. If a doctor/therapist ever implies that you will not get better because of your age, definitely get another opinion. Age can be a factor, but normally only a small part of a slow healing process. Take an active role in your own care, at least you and your family will have less surprises in the process. These Quick Tip Posts are designed to express one of hundreds of Golden Rules of Foot quickly to the reader. There will be larger posts later dealing with the subject in more detail. GOLDEN RULE OF FOOT: When you can walk 30 minutes at a good pace without pain and without limping after an injury for 3 straight days, you are ready to start a Walk Run Program. Breaking into fulltime wear of custom made functional foot orthotic devices should occur over a period of 10 to 14 days. On the day you pick up the orthotic devices, wear them for 1 hour if tolerated. This hour should only include active walking or standing. Do not count sitting time. Therefore, 1 hour of orthotic wear may actually occur over 2 to 6 hours in real time. If even 1 hour is difficult, attempt (2) 30 minute sessions, or (4) 15 minute sessions, with an hour off between the sessions. The breaking in process continues by adding 1 more hour each day until you are up to 8 hours of wear by the 8th day. Of course, due to many factors, it may take more than 8 days to build up to these 8 hours. Once you are at 8 hours, you should be able to go as long as you desire on any given day. Runners should run 1 mile longer with the orthotic devices each day (starting at 1 mile on the first day). Other athletic activities, like basketball, etc, should progress in 30 minute intervals daily (starting with 30 minutes the first day). If you get discomfort anywhere (foot, ankle, knee, hip or back) while breaking in the device, immediately remove the device, and leave it out of your shoe for the next 2 hours. If there is still time later in the day, you can try to re-wear them if you have not met your time allotment. It is important during the adjustment period to always have the regular shoe inserts with you in case you have to take out your Orthotic devices for this 2 hour period. The accommodation period is partially for foot comfort, but mainly for knee, hip, and back adjustment to the new positioning of the body and the new use of many muscle groups. 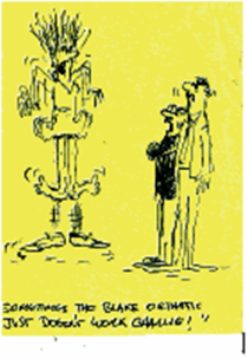 Golden Rule of Foot: Always blame any new ache or pain on the new Orthotic devices. Never push through any pain. The breaking in process must be pain free. Normally, patients are told to get used to the orthotic devices and to return in 6 weeks. However, 30% of patients return to the office in 2 weeks or so since they are having some problem with the devices. Adjustments are normally routine, and part of normal office visits. Occasionally, the orthotic devices or impression molds must be returned to the laboratory for further fine-tuning. The doctor/therapist prescribing the orthotic device should dispense them, watch you walk and/or run, and attempt to make the devices stable and comfortable. This is the perfect time to learn power lacing. Power lacing is a must for orthotic devices and will be the subject of a later post. The prescribing practitioner may use his/her judgment in allowing some discomfort, if further adjustments may lead to loss of stability. 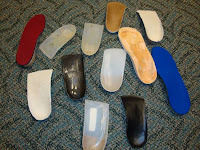 Wear socks with orthotic devices if the devices have no smooth top cover. Some practitioners dispense only the plastic device. If the devices squeak with certain shoes, remove the orthotic device from the shoe and apply powder (any type) to the inside of the shoe. Rub the powder along the sides of the inner liner where the orthotic device will be in contact with the shoe. This normally takes care of the squeaking for several months. Some of my patients slip hose (thin nylon) over the orthotic devices which accomplish the same function. When the orthotic device has a top cover, occasionally a noise will be created from an air pocket developing under the material at the heel. Carefully pull up the top cover if possible in the heel area. Use Barge® cement to initially glue both sides needing glue. Let air dry for 15 minutes. Then apply ample dabs of Superglue® or one of its knockoffs to the bottom of the heel and the side walls. Place the top cover back down, and hold for one minute to let the top cover reattach. When given orthotic devices with a top cover, it is helpful to check the device bimonthly to reattach any loose sections with superglue® with or without Barge cement. The practitioner may not tightly attach the top cover initially since multiple adjustments for improved function and comfort may be necessary. If the shoe utilized has a removable insert, and that insert has some form to it, remove it completely. You want the orthotic device to sit down in the shoe as low as possible for more stability. However, if you need more padding, apply a thin insole to the full foot or just the forefoot (like those sold in Dr. Scholl’s foot care areas of pharmacies). Check at http://www.drscholls.com/ . When receiving small dress orthotic devices, you need some short insoles for the front of the shoe in order to hold your foot from slipping out of the heel in some shoes. The orthotic device itself should not be wider than the shoe because this pushes the shoe away from your foot. Dress orthotic devices normally require little time to get use to, so breaking in is quick. However, listen to your body and remove the orthotic device for at least 2 hours if you have any discomfort. If you find that you need to grip with your toes in order to hold the shoes on with the inserts, more front padding must be used. Dr. Scholl’s® does sell this product. There are two specialty athletic orthotic devices that do follow these general rules, but have there own set of problems which will be listed in other posts. These are the Inverted Orthotic Device or a knockoff version, and the Memory Foam Accommodative Device. Hope this has been helpful. So you or someone you love is developing a bunion, what to do? Bunions are sometimes classified Stage I (you begin to see a bump), Stage II (the toe starts to drift towards the 2nd toe), Stage III (the 1st and 2nd toes come together), and Stage IV (the 1st toe moves under the 2nd toe with great instability to the entire foot as seen in the photo above). The goal of bunion care is to keep it in Stage II. During Stage II the bunion is not getting worse quickly since its alignment with the metatarsal is not too bad relatively. Stage IV is a surgical bunion and there are many great surgeries available. These surgical corrections, however, have a 6 month to 1 year recovery period depending on what is done. Stage III can persist for 3 weeks or 30 years, and in general is a stable place for your overall foot stability. Once the 2nd toe begins to drift dorsally (towards the top of your shoe), Stage III can quickly become Stage IV. I will spend more time in a later post on the 2nd toe itself. In Stage III, with the 1st and 2nd toes abutting, as you push off the ground at heel lift, the poor angle of the 1st toe pushes back on the metatarsal gradually increasing the bunion deformity over time. So the goal in treatment is to get the bunion back into Stage II---its Happy Place, and keep it there. The bunion will not go away, but you may stabilize the joint, eliminating or at least postponing surgery for a long time. Bunion surgeries have not changed dramatically in the last 30 years like knee replacements, yet, the post operative care has greatly improved. I believe that avoiding/postponing surgery now, with the chance of never needing it, is worth the possibility of better results in the future. You will see this is my bias against immediate surgical procedures. However, that being said, if you are disabled by anything like a bunion, try 6 months of aggressive conservative treatment first. If your condition has not improved after this time period, proceed with surgical advice. Your disability must match up with the risks and recovery period for the operation. Get 2 or 3 opinions, be a smart consumer, bring a friend or loved one to the appointments, make a logical decision, and go for it. I will discuss questions for the surgeon in a later post. Stage II in bunion development is where, when you stand on the ground, and look at your toes, there is still a gap or separation between the 1st and 2nd toes. Medium gel toe spreaders from Silipos® http://www.silipos.com/ or separators between those two toes instantly put the bunion in stage II. You wear them in any enclosed shoe. You can now buy socks, like Injinji ® http://www.injinji.com/ , and bedroom slippers, like Vibram ® Five Fingers http://www.vibramfivefingers.com/ , that have individual compartments for each toe to wear around the house. Several years ago, YogaPro® came out with YogaToes http://www.yogapro.com/ . The product has 5 individual compartments and patients stretch their toes for 30 minutes 2 to 7 days a week when they are sitting down. I usually start patients at 5 minutes a day several times a week and they can slowly build up time. 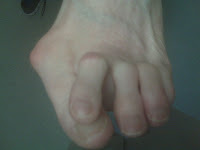 Some patients, especially with small toes, can not wear the product at all, or it must be modified. If you are in pain, do not wear the device (Good rule of thumb for most things). YogaToes are designed only to be used while sitting. Bed, Bath, & Beyond has an effective, but not as aggressive product, called Pampered Toes®. There is another YogaToes knockoff called Healthy Toes®. If your bunion is red, start massaging it. The red inflamed tissue adds to the discomfort and fragileness in shoes. Use circular motion to try to get rid of unwanted inflammation with soft tissue swelling. Gradually push harder during the massage. Massage for 5 minutes several times a day for 2 weeks longer than you think you need. What do you massage with? Ice cube is used if the bunion is sore. Technique of ice massage will be the topic of another post. If not sore, use massage oil, or any hydrating, lubricating, lotion or cream. It is the massage that moves out the bad stuff. Padding with 1/4" adhesive felt just proximal to the bunion (called proximal padding) instantly takes pressure off of the bunion and allows you to wear many shoes that would normally irritate. The padding can be purchased in many locations including http://www.mooremedical.com/ item #09229. You normally cut out a 1 inch square and place not over the bunion, but just behind towards the arch, but as close to the bunion as possible. Best to place it on your foot directly. You can experiment with size and shapes so it does something without showing. You should never place under the foot or on the big toe itself—that will make the bunion worse. Sometimes, you may want to put on top of the 1st metatarsal and the side as just described. Each pad can be used multiple times, so 1 roll can last almost a lifetime or be shared with other bunion sufferers you know or see in the gym. If you can not wait, start doing the flatfooted balancing exercises now. All strengthening exercises should be done for a maximum of three days a week. Foot and ankle exercises fatigue the leg so much that they should be mainly done in the evenings when you are home for good. Stand on one foot in a doorway. Put your hands at your side so that you can grab the door frame if needed. Very slightly bend your knee that you are standing on. With your eyes open, try to balance on each foot for one minute until this is easy. Then, gradually build up to two minutes at a time. Then, begin to close your eyes during the two minutes off and on until you can keep your eyes shut the entire 2 minutes. This easy task can take 1 month to 1 year to complete. The longer it takes, the more important it is for you to accomplish this tremendous strengthening exercise. Very important: do not push through any pain whether it is in your foot, ankle, knee, hip or back. This is really where a physical therapist can help making sure you are safe at what you are doing. You can always have a doctor write a prescription and send you to therapy for 4 sessions to learn a HEP (Home Exercise Program). In summary, bunion care should be started as soon as possible after making the diagnosis. Elements of treatment should include toe separators/spreaders, YogaToes or a knockoff version, proximal padding, possible socks and slippers with individual compartments, foot strengthening and massage. The role of orthotic devices for bunion treatment will be discussed in another post. Hope this was helpful. Of course, most of this advice is used post-operatively to stabilize the strengthen the foot if it ever gets to that point.